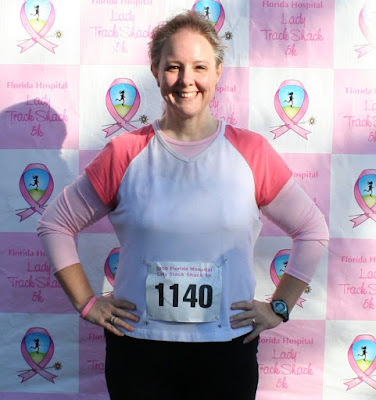 Cara's Weight Loss Journal: My 1st 5K... EVER! I ran my first ever 5K!!! This day was so huge for me. Look how far I've come!! If you would have told me a year and a half ago that I'd be running a 5K, I would have told you that you were out of your ever lovin mind! But here I am. I actually did it!! I still can't believe I did it. I actually teared up a little and got a big lump in my throat as I crossed the start line. I was so proud of myself for being there and doing this. Then I took a big swallow and said "Cara, stop that! You're not gonna let these runners see you cry." Then I took a deep breath and started down the track/road. I did great. I was so extremely nervous, though. I was afraid I'd over do it and then have to stop and catch my breath or maybe even drop out. I did get a little ahead of myself during the first half mile. I started breathing so heavy. I kept looking at my heart rate monitor but for some reason it was stuck on 118. I wonder if there's something wrong with it. For the first maybe three-quarters of a mile it kept saying 118. Then finally I looked down and it said 174. That was more like it. I knew my heart was racing! So I took a deep breath and slowed my pace down some. After the half way point, I started panicking thinking I wasn't going to be able to finish. I wasn't getting tired or anything, but I was just scared that I would have to stop. I don't know why I do this to myself. But I kept remembering Audrey from my WW meeting saying "slow and steady wins the race". So I kept saying that over and over to myself. I kept passing walkers. Never passed a runner. But a few walkers did pass me. My pace is slow as you can tell (14-minute mile). It was a little intimidating but I just moved over and let the walkers go past me. I felt so proud, though, when I could pass the walkers. I'd see them running and then walking and then running again. And these were girls that were much younger than me and looked to be in much better shape that I was. But they were huffing and puffing. I just kept pushing on. Then after the 2 mile marker, I started feeling in my muscles the effects of the panic and it started wearing me down. I reached deep inside me and then said "I can do all things through Christ who strengthens me". That verse took on a whole new meaning today. The word "strength" was literally just what it meant. I needed strength to finish. So I kept saying it over and over. I'd never been to this neighborhood before so I had no idea when the finish line was coming up. And that last mile seemed so long. I finally started seeing some of the runners who finished before me walking back towards us on the sidewalks so I knew I must be getting close. Then I finally saw the 3 mile marker and new the finish line was coming up soon so I kicked it up a notch and started running real hard and fast for the last 1/10th of a mile. I was so excited to see the finish line. I was looking for my daughter who was waiting for me at the finish line. 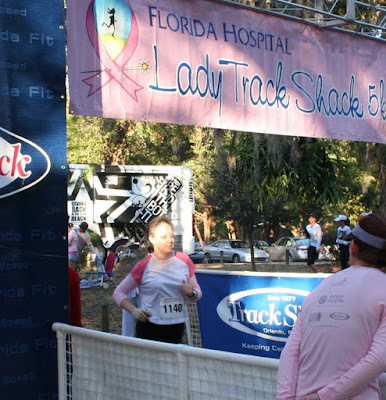 I wanted her to take pictures of me crossing the finish line but I couldn't find her anywhere. As I crossed the finish line I started crying again. I spotted her about 5 feet after I crossed the line. Whew! I did it! Then I swallowed the tears again. I ran to her and gave her a big hug and was so happy. Nothing could touch me then. Wow, I still can't believe I did it. 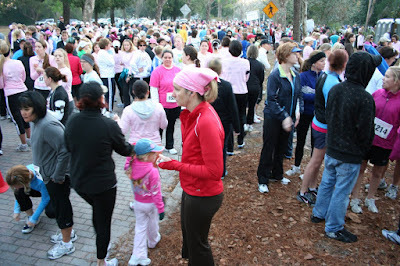 Here's a glimps of how many women were there this morning. I couldn't see the end of the line. This was me just after the race. Walking on cloud 9! 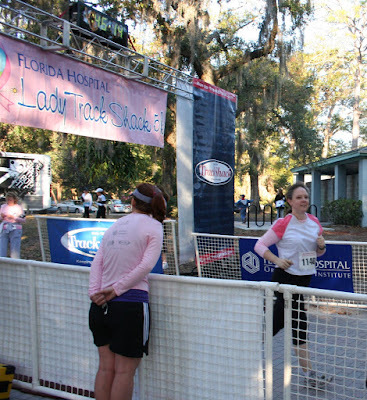 This was another one of me just after I crossed the finish line and spotted my daughter. Congratulations. I can't wait until one day I can run a 5k. Keep up the good work. That picture of you after you finished? You look absolutely radiant! Congrats on a huge accomplishment!!! I think that's AWESOME!!! I would LOVE to do that! I'm looking forward to the Relay for Life event that they do here. I am going o walk for HOURS and love every minute of it! I'm happy for you that you accomplished your goal and finished the race! That is awesome! what a great accomplishment!! Something to be proud of and a great reminder when times are tough that you CAN do anything you put your mind to! Congrats!! You are the Woman!! I can tell in your face in the after pic just how elated you were. WTG!!!! Congratulations! You must feel so proud! I'm proud of you! I'm inspired, too. (Maybe someday, I could do this...?) Congratulations again! I knew you could do it and I am thrilled for you. Can't wait until I do my biking event in April, I am sure I will feel the same way. You look GREAT! Keep up the good work! What an exciting post. You must feel so proud of yourself. Congratulations on all you have accomplished. You're an inspiration to me, I hope to be running races someday. Congratulations on a running your first 5K! I think you said it all when you stated "Look how far I've come!!" You have come such a long way and have accomplished so much, you should be very proud of yourself. Thank goodness for Audrey and her words of wisdom! Congratulation from your whole WW team. We never doubted you could do it for one moment! CONGRATS!!!! Oh I'm so proud of you!!!! You looked wonderful crossing the line! 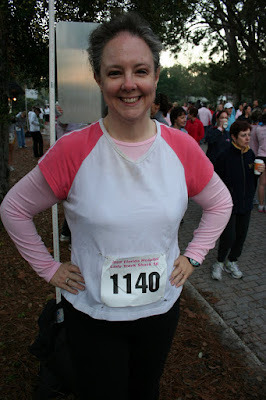 You brought back wonderful memories of my first 5K! You should be so proud of your self!! From one 14ish minute miler to another - Congrats again!!! That is SO awesome! I'll be there, too, someday! Amazing Cara, I am so happy for you! You are my hero. I'm so very proud of you. Congratulations!!! I am soooo excited for you! Great job!!! Wow! Congrats on the run! You were simply glowing! High Fives and Big Hugs! WOW! Awesome! Congrats! This is big, Cara! I cannot imagine even walking 5K at this point! Great job.....and by the way - you look so skinny! Great job. Well done. I am so glad to get to your blog again. I keep getting blocked by some switherroony site. Did a yahoo search and got here though. Keep up you great work and congrats.